No matter whether you observe Hanukkah, Kwanzaa, Christmas, or Winter Solstice, the holiday season is in full swing and it is a time for gratitude, friends and family. The City Council will be on Winter recess starting December 14th to January 11th but all of our offices will have staff on-duty except on Tuesday, December 25th and Tuesday, January 1st. From our City family to your family, we wish you a season of warmth and love. After some 3-1/2 years of preparation and debate, the City Council finally approved the Home Sharing Ordinance on Tuesday, December 11th. 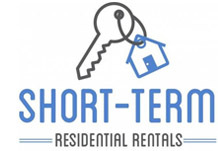 When these regulations take effect on July 1, 2019, they will provide the City with its first set of enforceable regulations to control the phenomenon known as short-term rentals (colloquially called "AirBnB," after the largest online platform brokering such rentals). The ordinance requires hosts to register with the City, restricts the use to primary residences for no more than 120 days a year unless an extension is applied for and granted, prohibits such rentals in Rent Stabilized apartments, and establishes an enforcement mechanism with penalties for violations. 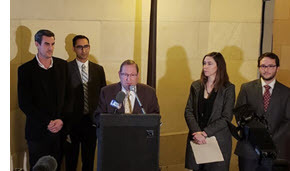 "It's not exactly the ordinance I would have written," said Councilmember Koretz, who joined his colleagues in the unanimous approval, "but it has key elements in it I fully support, such as the ban in rent controlled units. I would have preferred fewer days a year, a stronger primary residence requirement, and stiffer penalties. But this is a reminder that, as somebody once said, politics is the art of the possible. This is what we could agree on after taking so long and we couldn't wait any longer to continue to argue about details. If we learn that aspects of the law need to be changed in the future, we can address that at a later date." The Department of City Planning, which will administer the regulations, will spend the first half of 2019 putting together the administrative and enforcement team so that they'll be ready to go on July 1st. The popularity of vegan food is exploding worldwide for a variety of reasons including greenhouse gas emission reduction, animal welfare, and air and water quality issues associated with Industrial/ agricultural meat production. There is also growing awareness of the positive human health impacts of plant-based diets; and the increasing availability of highly palatable vegan food in restaurants and food stores. According to a recent survey, “Top Trends in Prepared Foods 2017,” there has been a 600 percent increase from 2014 to 2017 in the number of Americans who identify as vegan. The global market for vegan alternatives to cow’s milk is expected to reach $16.3 billion in 2018. There is an even larger growth of people want to eat a plant based protein for at least one meal per week. A vegan diet excludes animal products – meat, fish, dairy, eggs and honey. There are a wide range of plant based proteins readily available and often already found in concession kitchens. Plant-based proteins can include quinoa, legumes like beans or peas, in addition to soy products like edamame and tempeh. That is why Councilmember Koretz held a press conference to announce that he introduced legislation to require vegan protein options to be available at all large-scale entertainment venues and movie theaters in Los Angeles, and asking LAX to prioritize concessionaires who serve a plant-based menu in each terminal, and for the Department of Recreation, the Zoo, the Department of Aging and any other City-related food concessionaires to provide vegan protein entrées on their menus. The City’s Good Food Purchasing Program, brought to us by the LA Food Policy Council, gives extra points for plant-based foods and Councilmember Koretz wants all City departments to get top ratings. Phase III construction on the Balboa Pipeline Project continues along Balboa Blvd. (between Magnolia and Ventura Blvd.) and is still on target to be completed by the end of February or early March of next year. CD5 has negotiated with LADWP for most of the work to take place at night so that holiday shoppers will not have to worry about the additional traffic added to their commute. Every January, the Los Angeles Homeless Services Authority (LAHSA) conducts a census of the homeless population through the Greater Los Angeles Homeless Count. 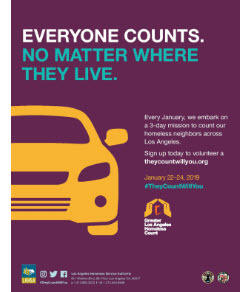 The Count helps us better understand homelessness in our region and direct resources where they are needed most. LAHSA needs at least 8,000 volunteers to canvas more than 80 cities and 200 communities across LA County. Our Chief of Staff Joan Pelico did her Holiday Shopping this year at the Getty House Bazaar hosted by Mayor Garcetti, First Lady Amy Wakeland and the Getty House Foundation. Joan bought gifts for her family and friends that were made by social enterprises that support Angelenos affected by homelessness. She was thrilled to buy so many wonderful pieces including some beautiful artwork created by very talented homeless individuals. Joan also had the opportunity to meet with some of the artists. “There is just something so special about giving back this holiday season and helping our homeless individuals in any way we can,” said Joan. "As a community we pulled together, and It is so wonderful to see how our strength prevailed and will continue in the aftermath of such a tragic time." 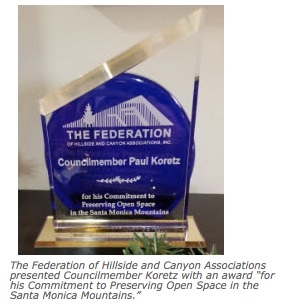 Councilmember Koretz was honored along with Friends of Griffith Park and Save Coldwater Canyon organizations by the Federation of Hillside and Canyon Associations at their 2018 Holiday Party. This year’s theme was “Protecting the Environment,” and Councilmember Koretz was honored to be celebrated for his environmental leadership. 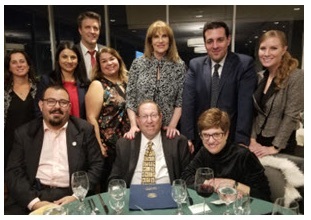 CD5 staff and family were proud to join in the celebration of Councilmember Koretz and collective partnerships with neighbors and environmental advocates in “Protecting the Environment” 2018 Hillside Federation dinner (L to R top row: Debbie Dyner-Harris, Gurmet Khara, Andy Shrader, Alison Simard, Joan Pelico, Jeff Ebenstein and Heather Rozman; L to R bottom row: Greg Martayan, Councilmember Koretz and Gail Koretz). Save a life and bring home happiness for the holidays! Probably the longest running adoption event still happening for L.A. Animal Services dogs is the Holiday Adoptions at Bookstar, an annual event since at least the late ‘90s. L.A. 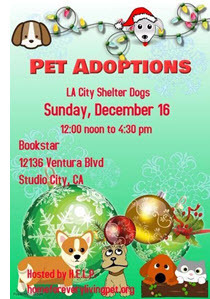 Animal Services dogs, usually from East Valley shelter, get selected by shelter staff to go to Bookstar on Ventura Blvd. near Laurel Canyon, to find new homes where people are shopping for the holidays. LAAS chooses and brings the dogs, and the event is otherwise organized and run by volunteers. The next adoption event will be this coming Sunday, December 16th from noon to 4:30 p.m. at Bookstar, 12136 Ventura Boulevard (near Laurel Canyon) in Studio City. It is a fun event and LAAS dogs get homes! Friends of Westwood Library and Los Angeles Musical Salon proudly invite you this Sunday, December 16th at 2:30 p.m. for the last event of the 2018 Season of the popular Free Concert Series at Westwood Library, 1248 Glendon Ave. They cap this season with the library's Quartet in Residence, the Fiato String Quartet, bringing two of the most famous quartets in the repertoire, contrasting Debussy's French impressionist style with Beethoven's unique mixture of the serious and the playful, the cosmic and the comic, in his last completed work. ... and a special Holiday tune to end our 2018 Season! Admission is free. The library garage will open at 2:00 p.m. and parking is complimentary. Concerts last approximately one hour with no intermission. After the concert, meet the musicians and enjoy refreshments hosted by Frida Mexican Cuisine in Westwood Village and the Friends of Westwood Library. Download the flyer here. Looking for a new furry companion? Check out these LA Animal Shelter Dogs and Cats of the Week from the West LA & East Valley City Animal Shelters. Please come meet our companion animals – they need homes now. The shelters are open Tuesday through Saturday, 8 am to 5 pm and Sunday, 11 am to 5 pm (closed Mondays). Click on any photo below for details.